Remodeled Stone House, Close To Down Town, Family & Dog Friendly, Great Deal! Sleeps 6. 3 Bedrooms. 2 Baths. One of Canon City's original stone houses, built in 1902 was completely gutted in 2009 from foundation to roof. Everything has been completely restored, preserving the old wooden trim and hardwood floors, yet bringing in new life with all the modern amenities. This 2 story, 3 bedroom, 2 full bath, living room, kitchen, pantry, game room, and fenced in backyard, includes large, new high-end windows, 10 foot high ceilings, and many energy efficient features. The main floor includes an open kitchen and dining table which seats 6, along with a pantry and all things needed to cook a delicious meal. There is a large living room that provides a very comfortable setting with new sofas, cushioned chairs and a large flat screen TV with cable and a DVD player; Internet is also provided. All three bedrooms present a comfortable atmosphere and act as an oasis for relaxation. The main floor bedroom holds a queen bed and the two upstairs bedrooms hold a queen bed in one room and two twin beds in the other bedroom. There is a balcony w/ seating off the upstairs queen bedroom. The game room is off the kitchen; a welcome setting for games, darts, poker table, a bar-top and additional room with plenty of storage. This room leads to the fenced in backyard where the patio furniture and gas grill are. Horseshoes in yard adjacent to this. A doggie door has been installed with a removable security panel if you wish to use it that leads to the fenced in yard. There are two bathrooms, one on each level of the house. The downstairs bathroom includes a spacious shower and the upstairs bathroom includes a large jetted tub. Stairs separate the two floors and as this is an older house, they are steeper than newer houses. The house has central air conditioning and central heat, and runs on a tank-less hot water heater. Solar panels have recently been installed. All guests are provided linens and towels. The house sits on 1 acre, is located at a dead end road, and has the east side of the property backed up to the high school fields; therefore the house is located in a quiet neighborhood and has a very secluded feel. There is 1 available driveway, which is very large and able to park trailers & boats. A shed is located to store any large equipment such as bikes or kayaks. 7 blocks from downtown Cañon City and 5-10 minute drive to many activities including Royal Gorge Railroad, Royal Gorge Bridge, wine tasting, zip-lining, whitewater rafting, hiking, biking, rock climbing, horseback riding, helicopter rides, segway tours, jeep tours, fishing, golfing, hunting, kayak park, splash pad, hot springs, & antiquing. 2 blocks and within walking distance are a local swimming pool w/ slides & diving boards, parks, tennis courts, and the high school fields where many locals take advantage of its use, including walking their family dogs or playing a game of soccer! 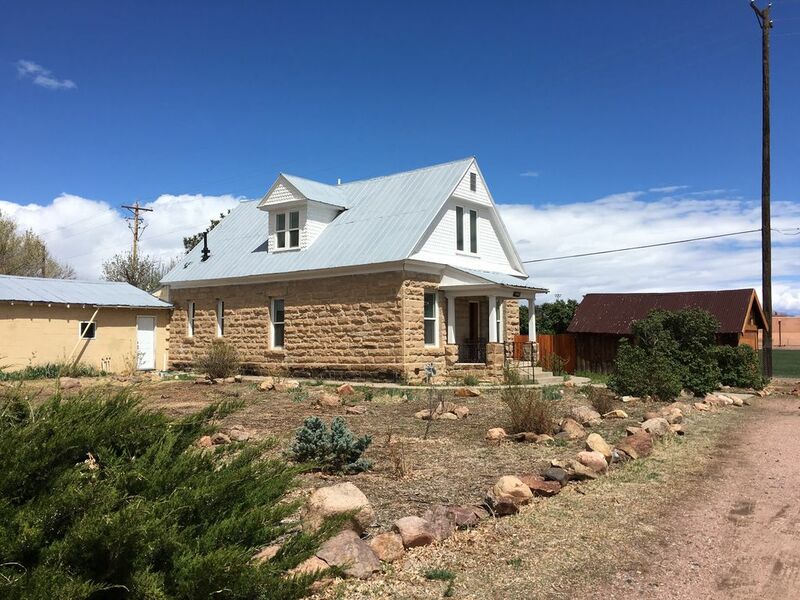 This is the PERFECT location as a base to all the surrounding areas of southern Colorado including Colorado Springs, Manitou Springs, Cripple Creek, Salida, Westcliffe, Florence, and Pueblo that are all within 1 hour. Attractions in these areas include but definitely not limited to Pikes Peak, Garden of the Gods, Seven Falls, Olympic Training Center, Cave of the Winds, Dinosaur Resource Center, Mining Railroad, Casinos, Bishops Castle, and shopping. Cañon City is especially proud to have many of Colorado's Scenic Byways run right through our backyard in all directions, so scenic drives are a must! Cañon City is a very convenient, comfortable, and affordable place to stay with all the friendly locals and none of the hustle and bustle of the larger cities near by. I moved here from New York in 2001, married and bought a house. My folks came to visit a few years layer and fell in love with the relaxed atmosphere of Cañon City, Colorado and decided to buy a house for future visits and hopefully encourage the rest of the family to visit. Having always loved old houses, they chose this old stone house built in 1902 that was completely gutted. Then they went back to NY... my husband and I were left with the task of renovation! For four years, we rebuilt this amazing house and poured as much love as possible into it! It was QUITE the TASK!!! Finally we are ready to share this amazing home with others who will also fall in love with the area and hopefully provide a place for you and your family to return to year after year as well. During the rebuilding, we realized that this house was special indeed... EVERYTHING had to be custom built... and I mean everything! The framing, door hanging, sheet rocking, mudding, tile laying, and trim work; you will notice every unique detail in this house. What could be salvaged and refinished was, despite the hours of labor put in to refinishing that old piece of barnwood turned into beautiful wood trim for the doorway! This old house in a renewed gem! You will experience this too, at the first step into the house when you notice the 10 foot ceilings, with 6 foot windows surrounded by gorgeous stained trim that has been collected from around the country from different antique stores. toilet, shower, Newly tiled, includes towels. toilet, jetted tub, Newly tiled, includes towels. We really enjoyed our stay. Everything you needed was available, kitchen well supplied along with all the comforts of home! Nice job on home and having notebook with all the helpful information on the area. We thoroughly enjoyed our stay in this historic home - my son, the history buff, wanted to learn more about the house. Although historic, it has been remodeled and upgraded with modern amenities while still retaining its charm. We had a great time teaching our sons to play darts in the game room. A great stay in Canon City! Fully enjoying this quaint and lovely remodeled house. Tastefully decorated and well stocked kitchen amenities. Great location in the heart of Canon City. Made a great launching point for all there is to do and see in the area. Great home base for Shelf Road climbing! So nice to have a warm and cozy place to stay after a hard day of climbing at Shelf Road. Some weekends you just don't want to rough it, you know what I'm saying? Anyway, our group had an awesome time hanging out here, cooking dinner, throwing darts, singing karaoke, playing board games, etc. Hope to come back again. My 2 sisters, 2 brothers and my self were in Canon City to celebrate my brother-in-law's 80th birthday and my brother's 60th birthday. The Whipple house was perfect. The house appears small on the outside but the rooms are spacious with high ceilings and large beautiful windows. The dining table easily accommodated all of us and there was plenty of comfortable seating in the living room where we had fun reminiscing. The house had every thing we needed, a well equipped kitchen, comfortable beds and even a dog door and fenced back yard for our goldendoodle. Fleur was delightful, accommodating and a pleasure to do business with. I would highly recommend the Whipple house. Everything about this property is wonderful. The check in process was easy and every amenity was available. The house is adorable and in a great location to main street. Thanks again for an awesome stay! In the heart of the Royal Gorge Region, this is a prime location to take part in all the activities in the Southern Colorado Region. We are located 10 minutes away from the Royal Gorge Bridge, the Royal Gorge Route Railroad, the Arkansas River which is the most commercially rafted river in the nation, and the top awarded winery in the state of Colorado, The Winery at Holy Cross Abbey. Day trips can be made to all the surrounding areas that include Pikes Peak and the cog railway, Garden of the Gods, Cave of the Winds, and Pueblo Reservoir without having to feel the hustle and bustle of those cities. Cañon City has a much more relaxed atmosphere than some of the neighboring cities, and we pride ourselves on the friendly locals! Pets considered upon owner's approval.